Adding a Google Slides presentation to your site is fast and easy. In fact, you’ll spend more time creating your first slide than embedding your presentation. That’s not to say that making a slideshow is difficult. It’s not. Google Slides gives you all the tools you need to craft professional-looking slides quickly using their templates and themes. Google Slides is one of the G Suite apps. It’s roughly equivalent to Microsoft PowerPoint in its function and capability. It’s also free and easy to use. And once you’ve created a slideshow in Google Slides, you can embed it into your website by simply copying a line of code. Why should you embed a Google Slides presentation on your Site? A presentation helps add visual interest to your page or post to keep your reader engaged. It can help break up a text heavy piece. Nobody reads anymore. They just skim. It helps keep people on your blog for longer, watching your slideshow. It’s better for your Search Engine Optimization (SEO). Embedding your slides gives you an SEO boost from the content of your slides. And since bounce rate is another factor in SEO, keeping people on your site for longer is also a plus. Why use Google Slides when you can embed SlideShare presentations just as easily? Both platforms allow you to embed your presentation on your post or your page. Google Slides is a more direct way to share your presentation, because you create your presentation and embed it from the one program. Google Slides also has templates you can work with to help you create attractive looking presentations. 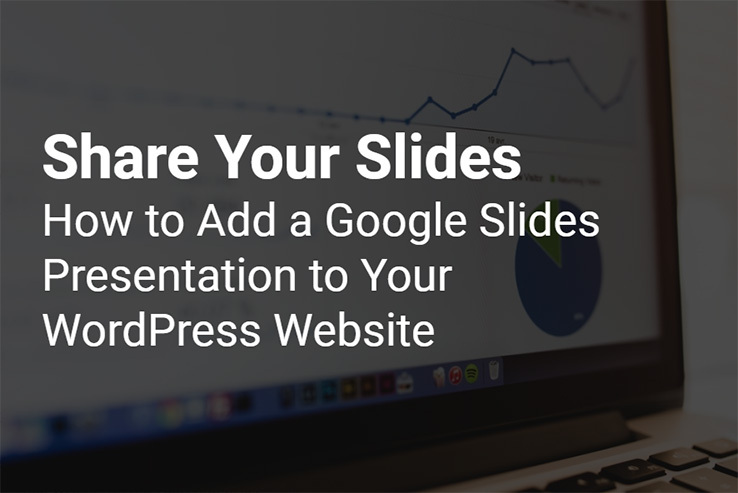 SlideShare has more options for sharing and generating traffic than Google Slides; however, it’s slightly more complex to use and you need to create your presentation in another program and upload it. Log in with your Google account. Log in with your LinkedIn account. Create your presentation in Google Slides. Will convert PowerPoint presos to G Slides automatically. Create your presentation in Adobe PDF, Open Office or Microsoft PowerPoint and upload it to SlideShare. Embed your presentation using an embed code. Embed your presentation using an embed code. Share with others by sending invites to your preso. Your presentation contains a share button when embedded to promote social sharing. Good for SEO because the keywords from the presentation are counted as part of your website. Good for SEO because SlideShare presentations, like YouTube, rank well in Google and can be shared and embedded by others. Collaborate in real time with team members. You’ve got a built-in audience at SlideShare. If you’re intimidated by the thought of designing your own slides, Google Slides has made things easier for you with many templates you can use as a jumping off point. 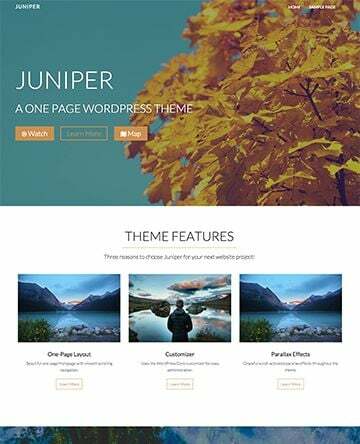 Once you’ve selected a template, you can customize the overall look of it by changing the theme. 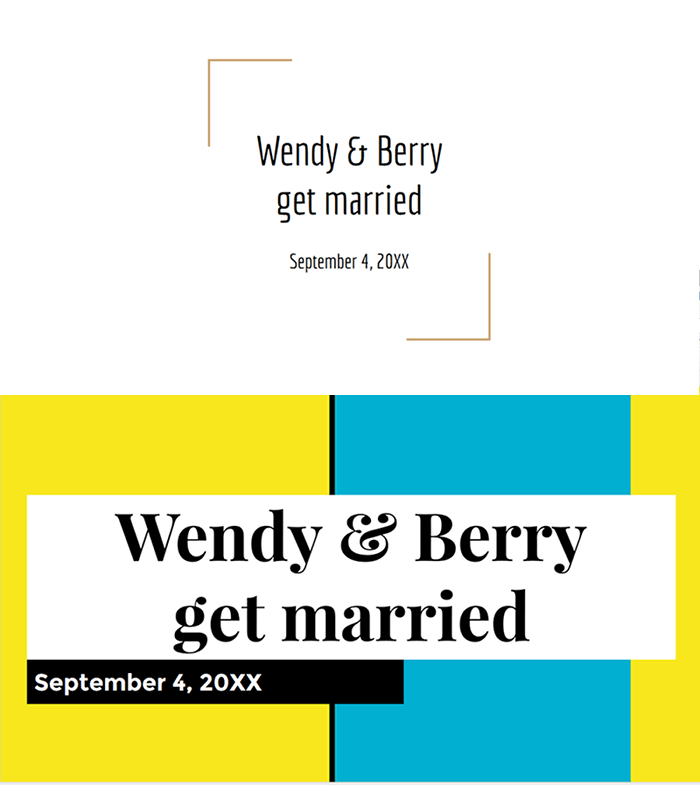 The top image is the default “wedding” template. And beneath it is the same template using the “Pop” theme. 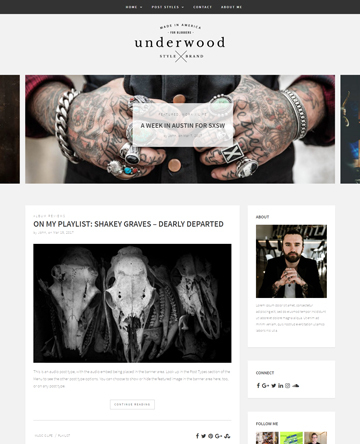 These preset templates and themes are great for anyone who hasn’t designed a slideshow before. 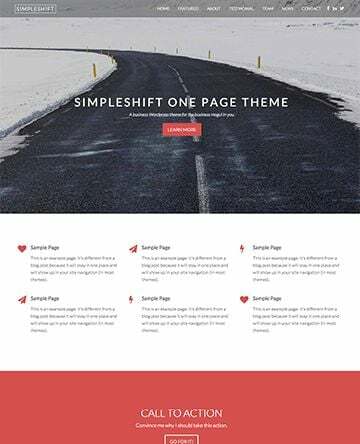 You can choose a template, a theme to work with, and add your content to create an attractive slideshow without too much trouble. What should your presentation be about? Many small businesses and entrepreneurs create slideshows out of their past content. It’s a great way to repurpose an old blog post or article. You can easily turn a blog post into a slideshow, especially if it’s a long and meaty one. It can be a great way to breathe new life into older content. As a bonus, it also saves you the time it takes to research and write a new post. If you’ve recently done a webinar, another option is to embed your webinar slide presentation. You’ve already done the work for the webinar, why not get extra mileage out of it? Should you use a plugin to embed your Slides? While it is possible to use a plugin to embed your Google Slides presentation on your site, it’s just as easy to do it yourself. Installing and configuring a plugin seems a little bit of an overkill, plus you’ll need to go through most of the same steps to grab the link, so why not just skip the plugin? So you’ve put the finishing touches on your Google Slides presentation and you’re ready to show it off to the world. In Google Slides, click on File > Publish to the web. We want to embed your slides, not link to them, so click on the Embed tab. Select the size of your slides. You’ve got preset options of small (480x299px), medium (960x569px), and large (1440x839px). Or you can choose a custom size. Select how quickly you’d like the slides to auto-advance. You can choose from one second up to one minute. Consider how long it will take your audience to read your slides. If they’re particularly text-heavy, you might want to make auto-advancement longer than one second so you don’t frustrate your readers. Tick the boxes if you’d like your slideshow to start immediately and if you’d like your slides to repeat once they reach the last slide. You’ll now be able to grab the embed code. It appears automatically highlighted by default, so you just need to hit Ctrl+C to copy it. 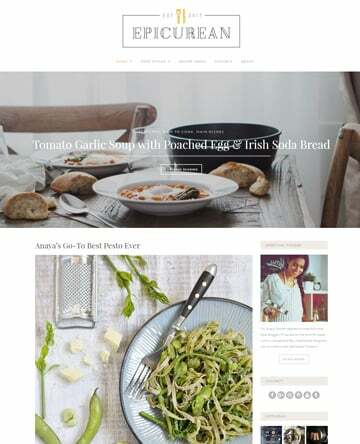 Head to your website, log in and open the WordPress editor for the page or post you want to add your slideshow to. Click into the Text editor, and paste (Ctrl+V) the embed code. 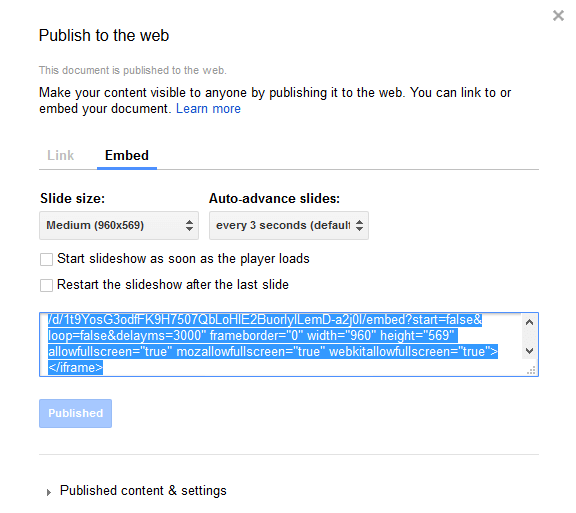 Publish or Preview your post or page to see your Google Slides presentation embedded. To start the slideshow, click on the Play arrow. The arrows to the left and right of the play button advance or go back a slide. Clicking Play starts the auto-advancement function. Remember, you set the timer on this setting back when you published your slideshow. 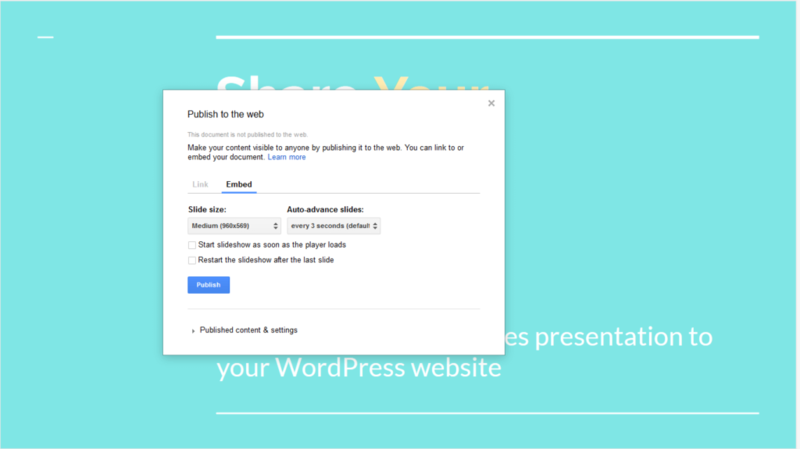 If you’ve accidentally made your slideshow too fast (or too slow), you can go back into the Publish to web settings on Google Slides and change it. Beside the arrow controls is the Navigation menu. It shows you where you are in the slideshow. Clicking on this button allows you to jump directly to any slide in the show. You can turn on the screen pointer if you like. This is not particularly useful for a visitor reading your slides, but is intended more for a live presentation of your slides. Your visitor can view your slideshow in full-screen mode by clicking on the Fullscreen icon. You can leave full-screen mode by clicking escape. Advance your slides by clicking the mouse anywhere on the screen. Finally, in the Settings option, you can open up the Speaker Notes or Report Abuse/Copyright. If you’ve prepared and added speaker notes to your Google Slides presentation, your reader will have access to this by clicking on Speaker Notes. Making a slideshow is a great way to spice up your content mix with an interactive, visual presentation. You can easily create a slideshow from old content to give it a new lease on life and save yourself the time of coming up with something new. Using Google Slides is free. It’s also easy to work with and embed on your site. You don’t even need to use a plugin and the finished product looks polished and is intuitive to use. Having a Google Slides presentation embedded helps to increase your engagement and decrease your bounce rate by giving your readers something different to look at on your page. Over to you – are Google Slide presentations part of your content strategy? Are you going to start using this strategy and embedding Google Slide presentations on your blog?